A heartwarming blend of medical mystery, intimate journal, comic survival guide, and “zenchanted” map to acceptance, this memoir recounts the story of a family’s journey within the often-invisible world of autoimmunity. 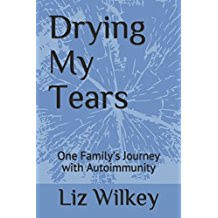 The book leads the reader through the misery and mayhem encountered while one woman attempted to raise three daughters with autoimmune conditions, such as lupus, Guillain-Barre syndrome, Hashimoto's thyroidititis, and spondyloarthritis. It then details what happened when a life-altering, autoimmune disease called Sjogren's Syndrome swooped down to hit her squarely in the eyes as well. Covering topics as diverse as “Identity Theft,” “The Doctor-Patient Fit,” "Little House of Illness" and “Using Buddhist Philosophy to Deal with Chronic Illness,” this book serves as a handbook of sorts for all those who wish to understand the emotions and obstacles encountered in living with chronic illness and provides a strategy for coping for the 50 million Americans who are currently living with autoimmune diseases.